The single nineteen minute track that makes up this second release from double bassist/sound artist Mike Bullock’s Shadowselves label is something of a paradox: a polyphonic soliloquy. In addition to playing double bass, Bullock creates sounds with synthesizer, voice and the movement of pens and pencils across paper. Bullock favors an elemental approach to the bass, foregrounding the sounds of its raw materials in action, whether in the form of bowed open strings or the contact of the wood of the bow against the strings’ metal surfaces. Similarly, Bullock’s vocalizations emphasize the grain of the voice unencumbered by language, while his synthesizer whooshes, chirps crackles and buzzes around it. From a quiet opening balanced on the point of a pencil moving vigorously on paper the piece broadens out to a gradually accumulating sound world; the sounds are layered sparingly but with enough interactive mass to create movement and a dynamic relationship among parts. This is one of those intimately-scaled recordings that succeeds in putting the listener on close terms with the instruments and objects creating sounds. As with the previous issue from Shadowselves, this release comes in a very limited edition of fifteen, with each CDR accompanied by a unique, beautifully-crafted porcelain tile handmade by Bullock and his wife Linda. 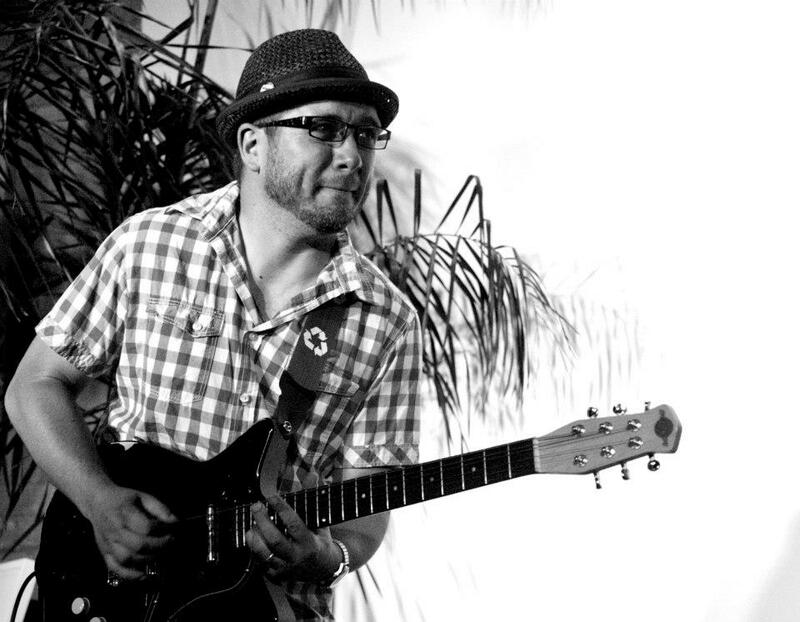 Ross Hammond is a Sacramento-based guitarist who has been making a name for himself in that area, as well as around the country. His most recent release was Cathedrals (AMN review), which he is soon to follow up with Humanity Suite, due out on May 6th. Ross recently answered a few of our questions. How did you get to where you are? Tell us about your history. I started playing guitar in junior high school. It was mostly the acoustic/Mel Bay method then. I wasn’t really into it until I got an electric guitar in high school and started a band with a couple of friends. I was hooked after that. The bands I played in were terrible, but it was always fun. I continued playing music through college, got a job in an acoustic guitar store (The 5th String in Sacramento) and met up then with great guitar teachers like John Green, Greg Townsend and Jim Beeler. I was really into Hendrix, Sly Stone, Freddie King and Curtis Mayfield then, and was playing a lot of blues and soul music. Jim turned me onto Wes Montgomery and I remember taking a stack of his Wes LPs home and going to my neighbor’s house to copy all of them. I wore out the Jimmy Smith and Wes Montgomery record, specifically. That was really my introduction to jazz. After that I was checking out a lot of soul jazz and more groove-based improv music. I got hip to San Francisco’s Broun Fellinis, TJ Kirk and the Original Heads around that time (maybe 1997), and thought there was a world of music worth exploring. Around the same time I discovered Pharaoh Sanders’ Black Unity at Tower Records in Sacramento. I bought it on a whim and that album totally blew me away. It was such a great mix of power and soul and groove and utter cacophony. I knew after that what I wanted to do. From then on I hooked up with saxophonist Tony Passarell in Sacramento and also played in an original jazz band in college called the Chili Palmer Project (with NY drummer Sameer Gupta). I was totally in over my head in that group but tried my best to hold on. That was pretty much the story until I decided to just go out on my own and start making records under my own name. It bummed me out when bands would split up and names would change, personnel would change, etc. I figured if I wanted to go after any particular thing I should just do it myself. I recorded my first trio record called Gauche with Sameer and Gerry Pineda in 2003. I put it out myself, and it’s really been a climb ever since then. Sacramento is really close to the Bay Area, and both have really great creative music scenes. I have been lucky enough to be able to play with a lot of great West Coast musicians in those scenes and have been really nurtured artistically because of it. Since then I’ve just tried to travel a lot and play with different musicians in new areas (Seattle, LA, NY, Boston, etc) and try to spread my circle a little more with each passing year. Free-jazz influences are present in your music, but you also incorporate so much more. What other styles do you find yourself using from time to time? There’s definitely free-jazz there. I’m drawn to the saxophone, honestly. I love Pharaoh, Coltrane, Archie Shepp, Marion Brown, David S. Ware, Oliver Lake, etc. One of the common threads in all of those players is a strong blues root, which I can identify with. I played blues and funk and soul long before I attempted jazz, and that is something that will always be there. Not necessarily playing 12 bar progressions, or playing particular scales, etc. I mean blues in the sense of the modality and the expressiveness that’s found in the music. I’m not a huge stickler in terms of ultra-intelligent jazz theory, or really any kind of jazz academic. While I can read and write music and be somewhat literate, I never wanted that to get in the way of the reason I started playing music in the first place. To me, it didn’t matter how pretty the notes and compositions were if there was nothing to say. Other than jazz and blues, I listen to a lot of folk music. I love Gillian Welch, Pete Seeger, Willie Nelson, Emmylou Harris and others in that ilk. I feel like that definitely comes through in the music because of the sing-songy nature of the melodies I tend to write. African guitar music like Boubacar Traore, Ali and Vieux Farka Toure, etc. is another area that I’ve jumped into. That music is a nice mashup of blues and folk songs and rhythm, and of course it’s impossible to really play it and sound authentic. But I do try to incorporate some of those ideas too. Humanity Suite is coming out in May, and overlaps stylistically in some ways with Cathedrals, but also seems to be more open-ended. Is that due to the fact that it is a live recording and thus more conducive to improv, or was it originally intended to be that way? Yes, Humanity Suite was the result of a commission I received from the Crocker Art Museum in Sacramento. I was asked to play a concert in conjuncture with the opening of artist Kara Walker’s exhibit. 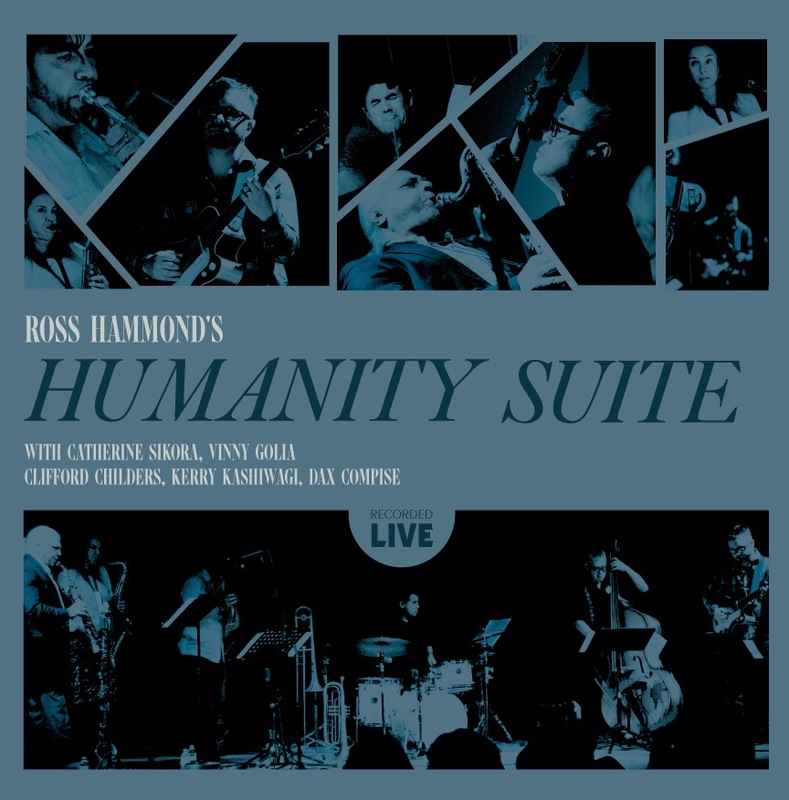 I thought it would be great to write music specifically for the event that was inspired by the artwork, so that’s how Humanity Suite came to be. I wrote it as a long-form composition, with a lot of room for improvisation amongst the band members. I wanted us to take our time with the music and to really let the different themes develop over the course of the set. I’m pretty happy with how it came out. For significant parts of Humanity Suite you let the horns do the talking, and your guitar takes something of a back seat. Some guitarists, perhaps stereotypically, consider themselves to be perpetual frontmen – is your approach more holistic? This project was definitely more holistic. I was more interested in the work of the group as a unit than making an in-your-face guitar record. This record has solo moments for each musician, but I tried to write the music with the idea of group improvisation over top of various themes, and to do smaller groups within the sextet (i.e., a double sax section, a section for drums and guitar, etc.). There is a lot of improvisation and loose-compositions throughout the record, but we all get after it in our solo sections too. With a group of 4 soloists (two of whom played multiple instruments) and a good rhythm section I thought it would be cool to do a more non-traditional “head, solo, solo, head” record. Improv counterpoint is a way to think of it, I guess. Vinny Golia plays a major role in your recent releases. What is your relationship with him like? Well, Vinny is the bomb. Honestly, there’s no one like him. He plays his horns like a wild animal who hasn’t eaten for 2 weeks (and that’s a good thing). 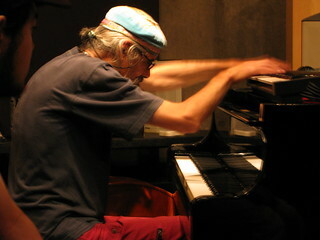 I’ve always respected Vinny’s aesthetic and his role in creating a haven for West Coast improvisers through his Nine Winds label. Vinny has no fear and no limits. I’m very fortunate to be able to play with him. If you have a free afternoon just to listen to music, what would you put on? Is anyone contemporary blowing you away these days? Lately I’ve been checking out a lot of music for the 12 string guitar. I’m really into James Blackshaw and Robbie Basho at the moment. Basho, in particular has a beautiful looseness in his playing that recalls jazz improvisation to me. He’ll set a theme and then he’ll vary the music enough to make it a beautiful mystery once inside the tune. Aside from that I’ve been listening to a lot of Albert Ayler, Fela, David S. Ware, Nicole Mitchell, Iron and Wine, Takemitsu, Public Enemy and some old thrash metal. It’s always different at our house. 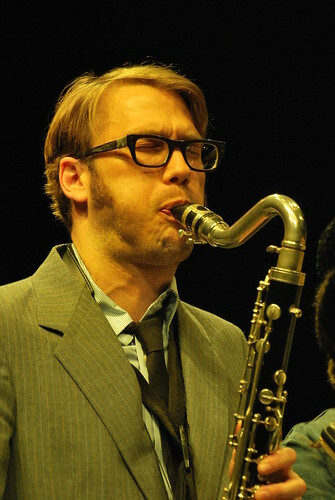 As far as contemporary players I really like Eric Hofbauer, Darius Jones, Ken Filiano, Mary Halverson, Ava Mendoza, Jeff Parker and a host of others. There’s lots of great music out there…. You recently started a family. How hard is it to balance the life of a touring musician and a father? Most of the touring I do is short distances, around the West Coast. When I’m out of town I’m usually back within a day or two. On a longer trip, say to the East Coast, I’ll be gone no more than a week. I generally don’t tour enough to put a strain on my home life. I work here in Sacramento as a musician full time, and also run a music school and arts space called “Gold Lion Arts” so it’s probably a better model for me to tour every few months and to build a solid foundation here for when I’m home. Also, when I’m gone I always bring my daughter a souvenir. In the larger picture though, I think the survival and continuation of this music requires players to build their own scenes in their hometowns. Not everyone (or maybe not anyone) can move to New York or San Francisco and make a living as a gigging musician. So, if that’s the case and you really love the music and want to keep it as a focal point of your life then it’s necessary to build and cultivate a scene yourself. This is what I’ve been involved in here in Sacramento for the last 10 years. We’ve harvested a great community here with festivals, regular gigs and a lot of collaborations. I’m happy to keep making music with my friends here and also watch my daughter grow up. Aside from the upcoming release of Humanity Suite, what else have you got coming up in 2014? I’d like to make a duo record with Vinny for reeds and acoustic guitar. That’s on my list if we can make it work. Also, drummer Alex Jenkins and I are working on a new duo project that pairs percussion with acoustic 12 string. We’ll be doing a few road trips later this year with that project. I’m in a new, very fun quartet with Kerry Kashiwagi, Dax Compise and Clifford Childers called ‘CRKD Quartet,’ and we have quite a few gigs lined up over the next few months. Aside from happenings in Sacramento, I’ll be on tour to the East Coast in April. I’ll be in Philadelphia with Calvin Weston and Max Johnson, and in NY over a series of dates with Johnson, Catherine Sikora, Stephen Haynes, Andrew Drury, Ken Filiano, Daryl Shawn, JD Parran and Billy Mintz. There are a few plans to go to Seattle this summer to play with saxophonist Neil Welch. Then I’ll be back to the East Coast again this Fall. Reedist Matt Bauder spent just a few years in Chicago, between 1999 and 2001, but he made a strong mark—and the city’s improvised music scene left its imprint on him in return. He’s a no-nonsense musician with an abiding curiosity. He has forged a deliberately mercurial musical personality over the years. There’s nothing mysterious about his ideas or interests, but their nonchalant diversity and range have made it hard to pin him down as this or that.